Hundreds of young musicians from Georges Vanier SS and Don Valley and Pleasant View Junior High Schools came together for the inaugural One World Arts Gala on June 7 at Georges Vanier to celebrate artistic creation as a force for positive change. The students are part of the One World Youth Arts Project, which recognizes the value of artistic creation and performance as an important medium for change in our world. Students and staff at the gala were joined by One World alumnus Mohanza ‘Obie’ Kelly. Obie is a local musician who is a graduate of the project and has gone on to a career in music (including a very successful Canadian Idol experience). He performed original music created in the One World Studios along with some popular R&B standards. 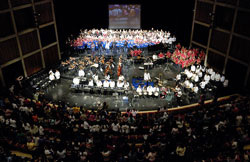 The finale featured Obie singing “Lean On Me” accompanied by nearly all of the young musicians from the three participating schools – band, chorus, strings and the One World house band. The One World Vocal Group, coached by Sharon Backman, performed the national anthem at the Canadian Urban Institute’s (CUI) Urban Leadership Awards ceremony on June 14 at the Royal York Hotel. The students were thrilled to meet with guests and honourees such as Mayor David Miller, media icon Moses Znaimer, and president of CUI and former Mayor of Toronto David Crombie. Along with the premier gala event and participation in the Urban Leadership Awards, the project celebrated the life and vision of Dr. Martin Luther King at the ‘Keeping the Dream Alive’ celebration in Hamilton. The One World Project is also associated with educational research projects at the University of Toronto, the Ontario Institute for Studies in Education and at Wilfrid Laurier University. One World has been presented at education conferences all over the world by associated graduate students at the University of Toronto, as part of their PhD preparations. Most recently Steve represented Canadian music educators at the prestigious "Tanglewood II International Symposium “Charting the Future,” a music symposium on music learning for the 21st century. The One World Youth Arts Project at Georges Vanier SS utilizes state-of-the-art digital audio recording studios to support student creativity, and the development of personal values.